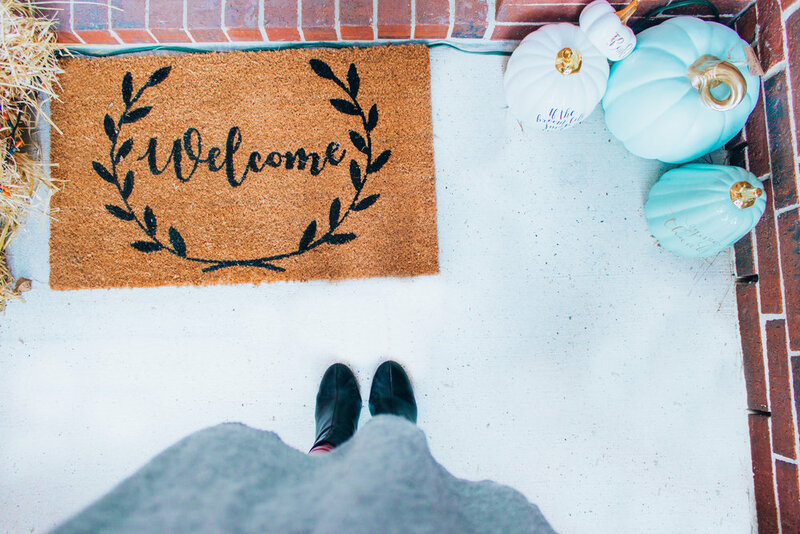 Anybody else loving all the Fall porch decoration inspiration we’re seeing all over Pinterest and Instagram this season? Definitely inspired me! 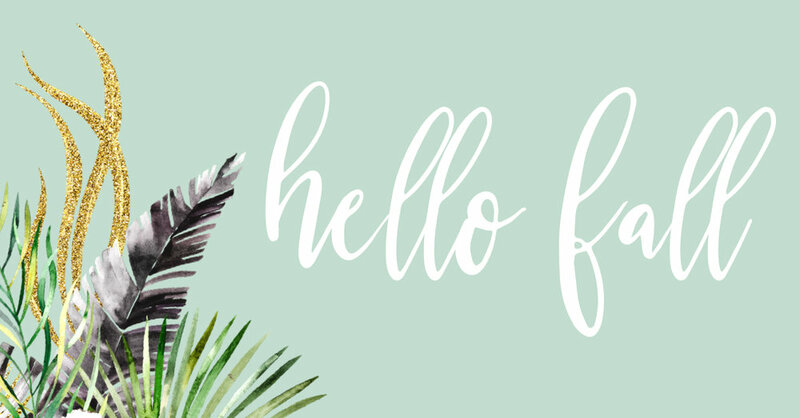 In today’s blog post, I’ll be sharing my Fall Haul from Hobby Lobby and Michael’s as well as spill on the details of the sales that are STILL GOING ON. That’s right! Even after Fall ends (that’s the best time to buy). PLUS, I’ll share a SUPER simple How to DIY: Fall Wreath! I know you’ll love how fast, rewarding and fun the process of doing it yourself can be! Read on for the details! I am wearing the necklace design “Maple”, a local piece by Cactus Rose! The local business is based in Houston, and have the trendiest designs and GREAT coupon codes. You might’ve seen that we recently ran a contest together on social media for a giveaway of 3 designs from the Fall Collection. If you missed entering the contest, just follow @Cactusxrose on Instagram for more great giveaway opportunities, and awesome sales! My mom was in town recently to visit and I had mentioned to her before she flew in that I wanted to try to make my own Fall wreath. From the minute she stepped off the plane she was like “when are we going to go to Hobby Lobby to get the supplies? !” I’ve never considered myself necessarily crafty, but my mom definitely is. She has been a preschool and/or art teacher for almost as long as I can remember. She LIVES for making cute crafts. I am so thankful that she chose to spend her vacation time from work here in Houston with me. She is truly my biggest supporter and I’m so lucky to have her. It was SO easy to create this simple wreath! No, really. It was about $5 for the base wreath, and then we picked out 3 individual pumpkin “picks” that we liked, some fall florals, and some decorative leaves to create a very modest modern wreath. 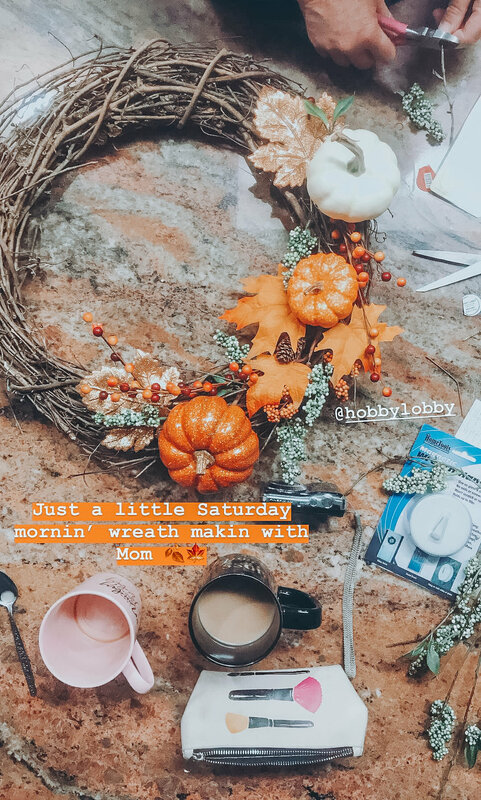 All we did was arrange and stick the pumpkins and fall florals into the wreath, and then attach the non pick items (just the glitter leaves) with blank metal twine. We attached the magnetic wreath hanger to the door, and it was done! Hobby Lobby extended the sale that I originally shopped around Labor Day. They have sales each year for 40-50% off throughout the Fall season. Right now, you’re in luck! 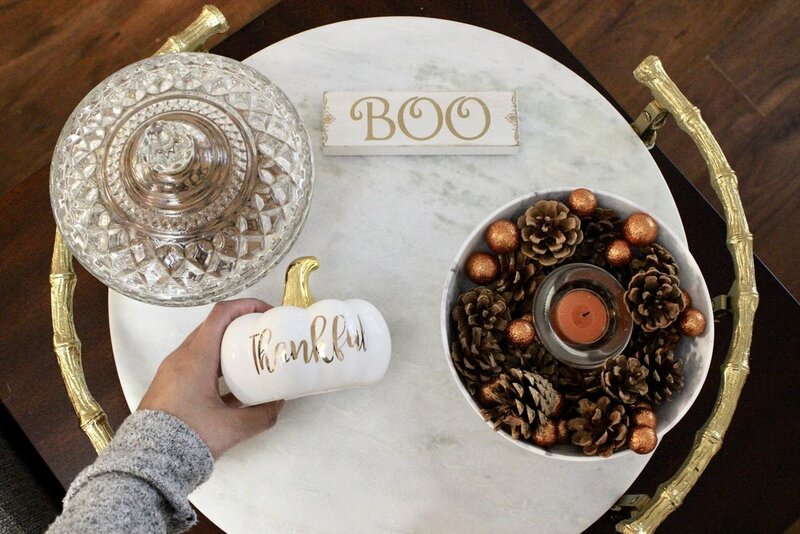 Grab some Fall stuff for next year (while it’s cheap) or buy Christmas decor for 50% off! All in all, it costs about $20 to make this wreath. So doable. Most of the wreaths that I was looking at that were even HALFWAY cute were $30-$60. Yikes, no thanks. What’s nice about the wreath that we made is that next year if I decide that I want a different design, I can simply pop the picks out and reuse the wreath! That’s it for today! Comment below and let me know how you decorated for Fall or how you plan to spend Halloween! Stay tuned! Next post will be up soon about my recent travels in Greece. Tell me what you want to hear about below in the comments! Are you on the Muse Mail mailing list yet? If not, subscribe at the bottom of the page to be the first to know when a new post is up! This is especially helpful for 50% off sale posts like this one that you won’t want to miss (wink wink).